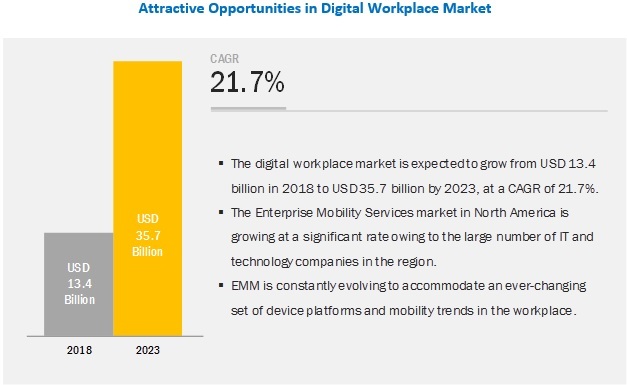 [129 Pages Report] Markets and Markets expects the digital workplace market size to grow from USD 13.4 billion in 2018 to USD 35.7 billion by 2023, at a Compound Annual Growth Rate (CAGR) of 21.7% during the forecast period. Availability of new tools and technologies, and employees demanding greater flexibility in terms of work-life balance are the major driving factors in the digital workplace market. Digital workplace services are gaining huge traction owing to the benefits they offer. The benefits include enhanced utilization of resources, which leads to improved security and application delivery. Digital workplace services are further categorized into professional services and managed services. Professional services help consult, integrate, and support organizations across various industries in effectively dealing with threats, thereby ensuring visibility and security across all business functions. The adoption of digital workplace solutions and services is higher in the large enterprises segment, and the trend is expected to continue during the forecast period. With digital transformation solutions being integrated with big data, social media, and mobile devices, large enterprises are increasingly opting for these solutions to improve their business process model and increase their revenue. Large enterprises are making significant investments in tactical marketing techniques to sustain their positions in highly competitive markets. The enterprises are rapidly adopting digital workplace solutions and services by leveraging other advanced technologies, such as facial recognition software, mobile platforms, and radio-frequency identification. North America is estimated to have the largest market size among all other regions, and the trend is expected to continue till 2023. North America is the most mature market in terms of adopting digital workplace solutions and services. As the region is home to a huge number of enterprises and has abundant technical expertise, it adopts digital workplace solutions and services to help the enterprises have advanced IT infrastructures. Some of the factors driving the adoption of digital workplace solutions and services in North America are the advancements in cloud computing, big data, analytics, Internet of Things (IoT), and machine learning. There is a huge adoption rate for digital workplace solutions and services in this region, especially in the telecommunications and ITES, Banking, Financial Services, and Insurance (BFSI), and retail verticals. As the benefits of adopting cloud technologies are becoming evident, along with the need to offer enhanced software quality and security, meet compliance requirements, and avoid risks, companies are rapidly adopting digital workplace solutions and services. The US and Canada are the top countries contributing to the digital workplace market in North America. 15 major vendors in the digital workplace include IBM (US), Atos (France), Wipro (India), DXC Technology (US), NTT Data (Japan), Citrix(US), Unisys (US), Capgemini (France), Cognizant (US), Accenture (Ireland), TCS (India), CompuCom(US), HCL (India), Stefanini (US), Computacenter (UK), and Getronics (Netherlands). In May 2018, DXC Technology launched DXC Platform-as-a-Service (PaaS) for SAP solutions on AWS Cloud to provide a cost-effective way for its users to migrate their SAP solutions to an automated on-demand cloud platform. In May 2018, Citrix launched Industry First Digital Workspace which would unify the experience and secure SaaS, Mobile and Virtual Apps and content across all endpoints. In August 2017, the release of IBM Cloud Application Performance Management had new features like resource monitoring of IBM API Connect environments and Transaction tracking and deep-dive diagnostics for Red Hat JBoss runtimes, along with monitoring of Siebel environments. What are the major challenges faced by enterprises while deploying various digital workplace services? Where and to what extent organizations need to outsource their services? Which of the talent and technology gaps of organizations can affect business operations? What are the challenges faced by manage service providers while integrating new technologies with a client’s existing IT infrastructure? The study involved 4 major activities in estimating the current market size for the digital workplace market. Exhaustive secondary research was done to collect information on the market. The next step was to validate these findings, assumptions, and sizing with industry experts across the value chain using primary research. Both top-down and bottom-up approaches were employed to estimate the complete market size. Thereafter, the market breakdown and data triangulation procedures were used to estimate the market size of the segments and subsegments of the digital workplace market. In the secondary research process, various secondary sources, such as Hoovers, Bloomberg BusinessWeek, and Dun & Bradstreet have been referred to, to identify and collect information for this study. These secondary sources included annual reports, press releases and investor presentations of companies, whitepapers, certified publications and articles by recognized authors, gold standard and silver standard websites, regulatory bodies, trade directories, and databases. It includes 15 major vendors IBM (US), Atos (France), Wipro (India), DXC Technology (US), NTT Data (Japan), Citrix (US), Unisys (US), Capgemini (France), Cognizant (US), Accenture (Ireland), TCS (India), CompuCom (US), HCL (India), Stefanini (US) ,Computacenter (UK) and Getronics (Netherlands).